Following on the heels of the successful Blue Ridge Music Trails of North Carolina previously published by UNC press comes the equally enjoyable exploration of another aspect of the rich musical culture of the state. 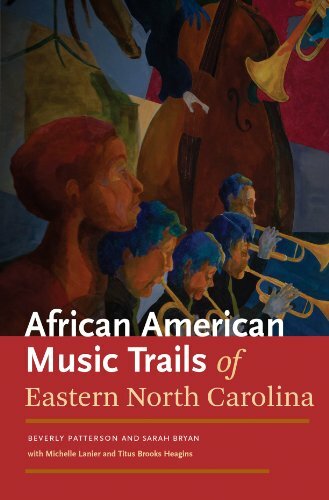 While the previous book focused on the western portion of North Carolina, African American Music Trails develops the story of the history and people of the eastern part of the state. The book focuses on eight counties (none of which are large urban areas) that were influential regions for the development of African American contributions to modern music. This book describes a very fluid situation with regard to music. Well-known performers would tour the region, performing in the various cities and towns. Local musicians would develop and often move on to other venues, including New York City; however, unlike Thomas Wolfe, many of them were able to come back home again. A broad mix of musical styles is described, including jazz, rhythm and blues, and gospel. In many cases, performers would get their start in one venue and then move into another style later in their careers. One theme that runs throughout the book is the strong influence of the churches on the musical development of performers. Many of the artists describe how they got their start playing or singing (or both) in a church setting and express their appreciation to their teachers and mentors in the churches who taught them the skills and provided encouragement. The book is valuable for illustrating the musical histories, but is also an exceptional resource for oral histories. There are many examples of interviews where the life of the community and of the family is described in detail. The tumultuous issues of segregation receive detailed coverage, especially the personal stories of what African-American residents experienced during the early and mid-20th century; however, the overall tone of these recollections is not one of anger, but simply a recognition of what once was, and a realization that change has come, even if this particular story is not yet complete. Each of the geographic sections contains a listing of local places to visit and events to enjoy, both historical and musical. There is a variety of activities throughout the year, although most take place in the summer months when the weather permits outdoor performances. Southern cooking has its own unique dishes and the book points out local restaurants where this type of menu can be enjoyed. Available are such dishes as shrimp and grits (it sounds unusual, but makes an excellent dinner). And of course there is barbeque—everywhere in the region you can find North Carolina barbeque. This is not your Texas-style stuff with lots of sauce. North Carolina barbeque is unique, indescribable, and delicious. Accompanying the book is a 17-track CD that highlights several of the performers mentioned. Six of the tracks feature gospel selections, showing the profound influence the local church had on these musicians. Other tracks include a selection by Thelonious Monk (born in Rocky Mount, NC), one of the outstanding jazz performers of the 20th century. African American Music Trails of Eastern North Carolina is an invaluable resource for the study of 20th century popular music.